So this week I have a finish – hurray! The quilt in question is Theo’s second birthday present. Does he need another quilt? Errr probably not, but he has a compulsive quilter for a mother and when I spotted this baby quilt a while ago I was desperate to make my own version. The fabric it is based around is Alexander Henry’s Smiles Around The World. I fussy cut each face and framed it with a Kona solid and then built up the houses with co-ordinating scraps. The border is made from a Moda fabric and the binding is by Birch fabrics. They are very similar, but subtly different. If you think that was very clever and calculated on my behalf you are wrong! I simply bought the wrong one when I went back to buy binding fabric, but it’s a happy mistake! For the back I used more of the Moda dots, mixed with solids (the largest part is Kona Robin Egg) and paper-pieced Theo’s name on the back using My abc’s pattern by Diane Bohn. As a result of that decision a very strange thing happened (here comes the crazy bit!) I missed building the relationship that you do with a quilt when you quilt it! All the handling and feeling and feeding through the machine, and watching it change before your eyes. So when it came back to me in the mail I didn’t actually like it! However over the last three nights as I have hand sewn the binding on to it, and handled it again, we have developed that relationship, and now like all my quilts, it’s a thing I love. So what’s everyone else been doing? I have nothing to link up with at the moment due to being extremely lazy since my holiday! What a great quilt for Theo. He is going to love telling you his colours and spotting all the different folk living on it! I wish I could get my lettering to go as good as yours. It’s interesting what you say about the longarm quilting process. I agree with you that the quilting bit, although sometime arduous and tiresome, is an important part of the love affair. This is absolutely amazing! I am always in awe of quilters, but this is really something special. I’m sure Theo will love it and treasure it for many years. I love the quilt – it’s beautiful! Theo’s a lucky boy! I’m in the middle of my latest sewing project still so nothing to share at the moment, but it should be ready by next Thursday. I love your quilt! It’s fantastic, I want to make one too. I love the name on the back too, great font! I was wondering if I could join your linky party too. I live in Italy and my Mum is British. What do you think? Wow! 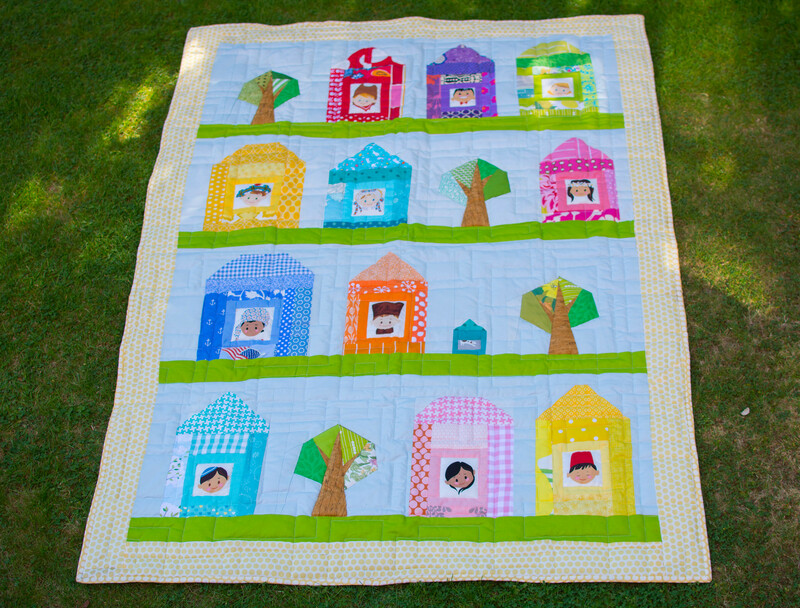 What an amazing and beautiful quilt – I bet Theo loves it!